As most anyone who has ever looked into an airplane cockpit while boarding, the pilot and crew were going through a check list to insure nothing in preparation for the flight was overlooked, assuring safety to the crew and all the passengers. “Data suggest that at least half of all surgical complications are avoidable. Previous efforts to implement practices designed to reduce surgical-site infections or anesthesia-related mishaps have been shown to reduce complications significantly. A growing body of evidence also links teamwork in surgery to improved outcomes, with high-functioning teams achieving significantly reduced rates of adverse events. The Affordable Healthcare Act for All Americans is without a doubt, a large and complex piece of legislation at just over 2,400 pages. But how big is 2,400 pages when wide margins, lines numbered, text double spaced, large font, multiple levels of indent, and more than a few references to other documents? The sample page below (standard 8.5 inch wide paper) is indicative of the 2,400 page document. The actual content is but a small fraction of a page. Aside from the claims of too lengthly and complex, Republicans argued that this was a Democratic bill rammed through congress. Interestingly, AHA includes more than 160 Republican amendments accepted during the month-long mark-up through just one committee (HELP), one of the longest in Congressional history. Critics have claimed it’s a government takeover of our health system. It may be news to those critics but half of the health system is already government-run. And the great bulk of the reform bill deals with steps to improve existing government systems that has hardly drawn any attention. The following provides a quick breakdown of the law sections. The PDF report that can be viewed/downloaded shows the entire table of contents. There are 10 “Titles” or major topics in the bill. Only the first, at 374 pages, less than one sixth of the entire bill deals with changes to how the private sector handles health care. Yet, this is the section that has garnered nearly all the criticism. The bulk of Title I deals with prohibiting abuses by the insurance industry, which, if you ask on an issue by issue basis, most people will agree with the new provisions. Nothing in the bill involves a “takeover” of private insurers. The next three Titles [II,III,IV] deal with improving Medicare and Medicaid programs and comprise 852 pages, one-third of the bill. These Titles address reduction of waste, fraud and abuse, and pilot new payment methods towards a “results” oriented method common in most other industrialized countries. There are few objections to this section. Title V, at 256 pages, addresses anticipated shortages of primary physicians and other healthcare workers due to services that will be required by aging baby boomers. This is totally opposite the “death panels” that ration healthcare that unfortunately got too much press for a falsehood. Title VI uses 323 pages to improve transparency and integrity, yet more efforts to reduce waste, fraud and abuse in both the public and private health sectors. Who objects to efforts like this? 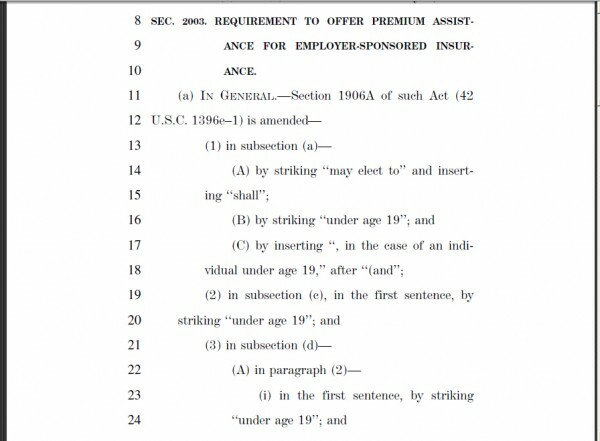 Title VIII addresses ‘‘Community Living Assistance Services and Supports Act’’ or CLASS Act. This title The purpose of this title is to establish a national voluntary insurance program for purchasing community living assistance services and supports. Moving people from higher cost hospitals and nursing homes to assisted living lowers costs, a laudable goal. Title IX includes the revenue provisions that include provisions to raise revenue to pay for the expanded coverage. The final Title X addresses 1) Medicaid and CHIP, 2) Support for pregnant and parenting women, and the major section 3) Indian health care improvements. None are controversial issues. 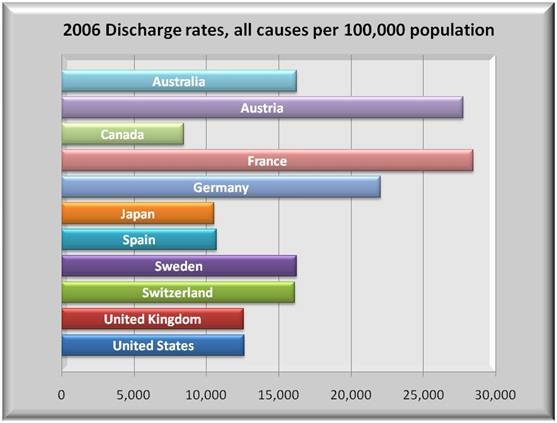 A summary glance at the graphs below should serve notice to all that the U.S. healthcare is in crisis. 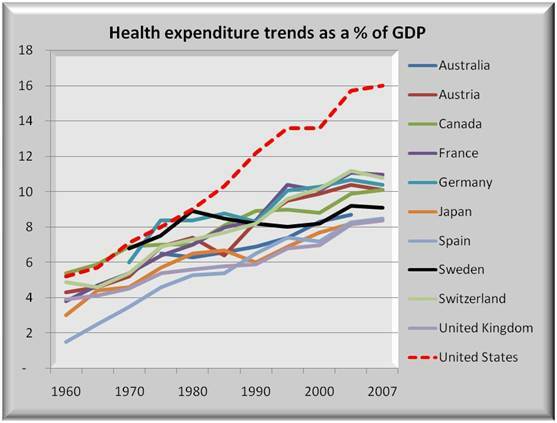 The left graphs show 2006 health spending both as a percent of GDP and on a per capita basis to be far above all other nations in the OECD (Organization for Economic Co-operation and Development). And if that wasn’t bad enough, the graphs on the right show that the trend is so bad compared to these OECD countries that without a major policy change, the U.S. will be paying far more into health care and far less in productive activities compared to its competitor nations. That all were similar years ago suggests that a U.S. solution is possible. 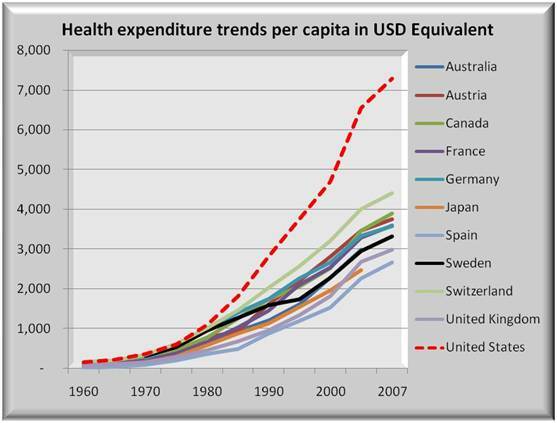 Yet, for all these higher costs, is the U.S. really getting better health care than other OECD countries? Graphs show only selected countries, but data include all 30 nations. The U.S. more often than not compares unfavorably in key areas. 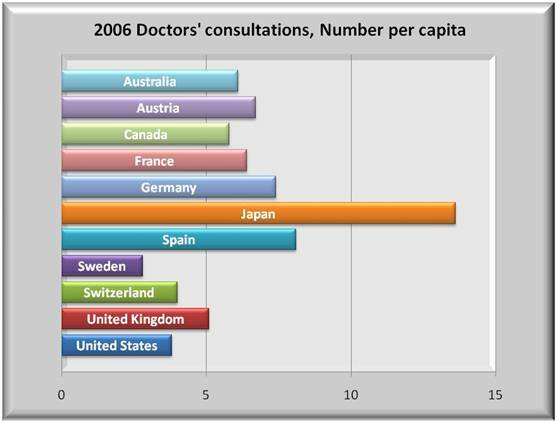 All data in this report are derived from OECD Health Data 2009 – Version: June 09 . Below each graph are all nations’ computed average, the percent the U.S. is over or under that average, and the min and max for those criteria. Of the areas selected, the U.S. is significantly above average in % of GDP spend, health care and prescription drug costs per capita, MRI units, CT scanners, and infant mortality. The U.S. is significantly below average in acute care beds, doctor’s consultations and hospital discharge rates per capita, in average length of stay in acute care hospitals, and in population over 15 years old who smoke. 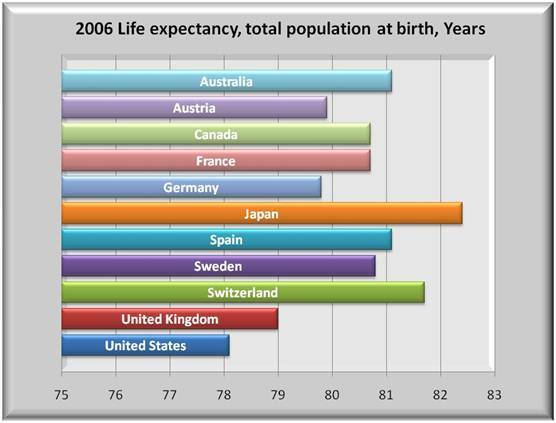 The U.S. is about average in life expectancy at birth but lags key European countries. It is average in cancer death rate. There are other factors that are not part of the OECD report, but the issue is whether the U.S. is getting its money’s worth. Average: 8.9% U.S. vs. Average: 78% Minimum: 5.8% Maximum: 15.8%. 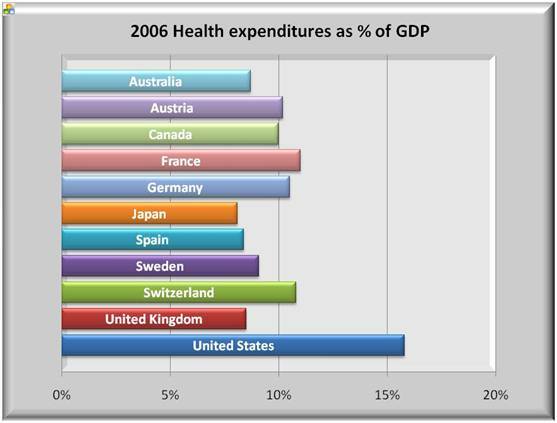 The U.S. clearly pays the highest percent of its GDP for health care. The trend of OECD countries is clearly lower than for the U.S.
Average: $3,073 U.S. vs. Average: 126% Minimum: $1,322 Maximum: $6,933. 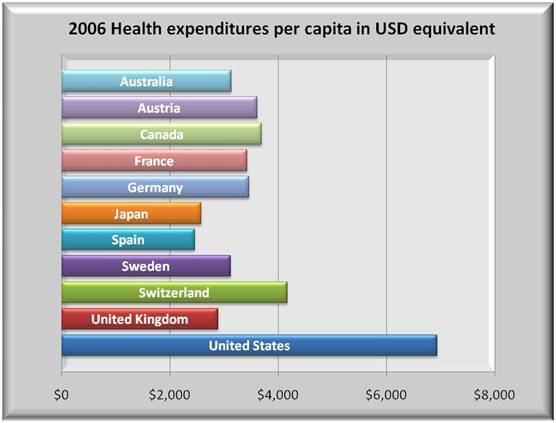 The U.S. clearly pays the highest per capita cost for health care. 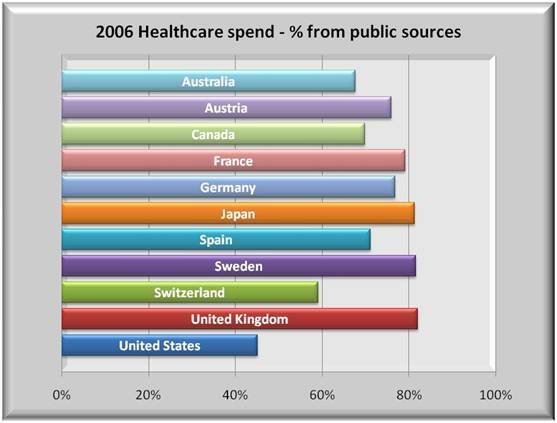 There is still a large percent of private health participation in OECD nations. 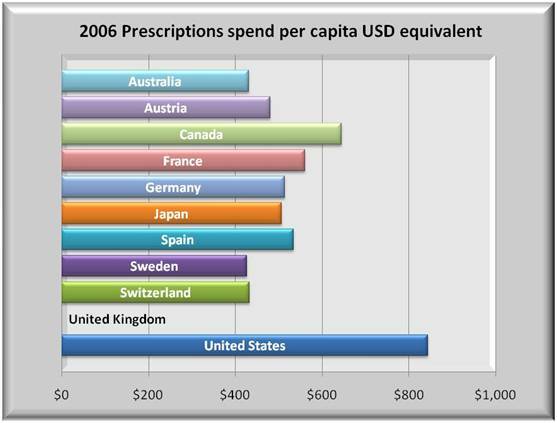 The U.S. pays almost double per capita for its drugs versus the OECD. While the U.S. is comparable to some nations, it lags behind some key nations. Average: 9.7 U.S. vs. Average: 173% Minimum: 1.4 Maximum: 40.1. 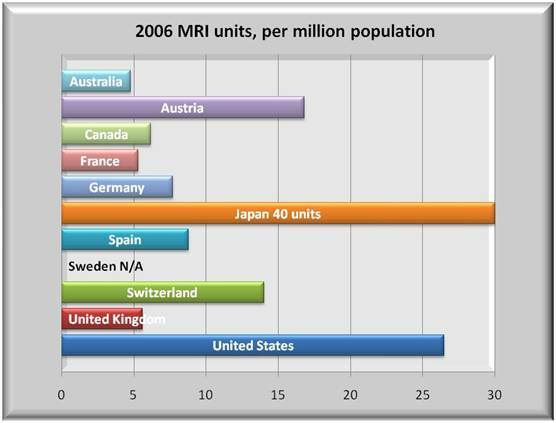 Except for Japan, the U.S. has more than twice as many MRI’s as other nations. Average: 21.7 U.S. vs. Average: +57% Minimum: 3.4 Maximum: 92.6. 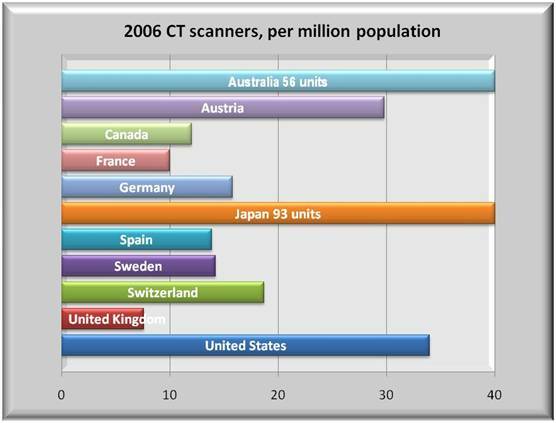 Not quite as extreme as MRI units, but the US is still out front of EU countries. Average: 6.7 U.S. vs. Average: -43% Minimum: 2.8 Maximum: 13.6. 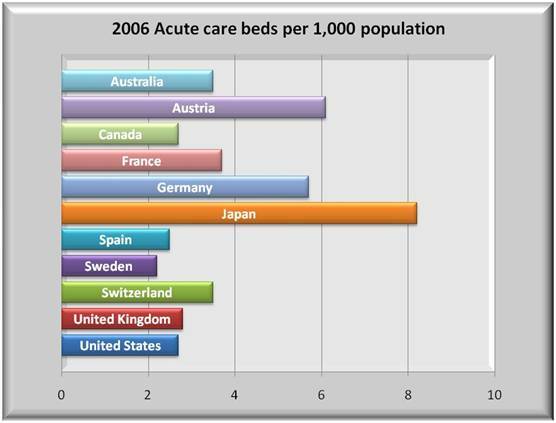 Access to care in other countries? They are far ahead of the U.S. in this category. Average: 16,256 U.S. vs. Average: -22% Minimum: 5,486 Maximum: 28,440. If you do not admit, there is no discharge. U.S. is moving to outpatient. Average: 6.9 U.S. vs. Average: -19% Minimum: 3.9 Maximum: 19.2. 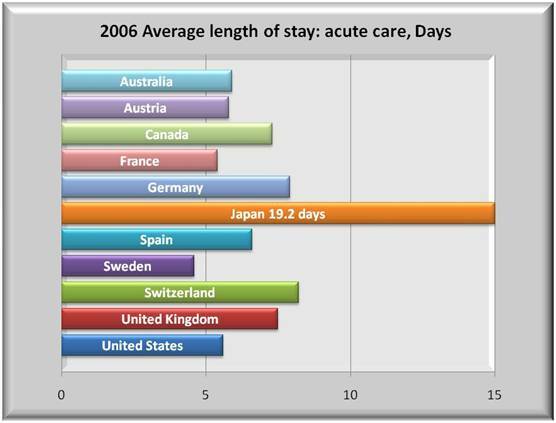 But for those needing acute care, the U.S. is about average for other than Japan. Average: 79 U.S. vs. Average: -1% Minimum: 71.6 Maximum: 82.4. 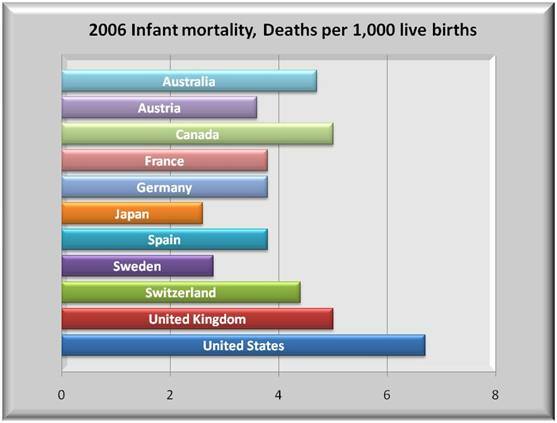 Considered a health quality factor, the U.S. lags behind key countries. Average: 5.1 U.S. vs. Average: +31% Minimum: 1.4 Maximum: 22.3. The U.S. clearly lags in this health quality measure. 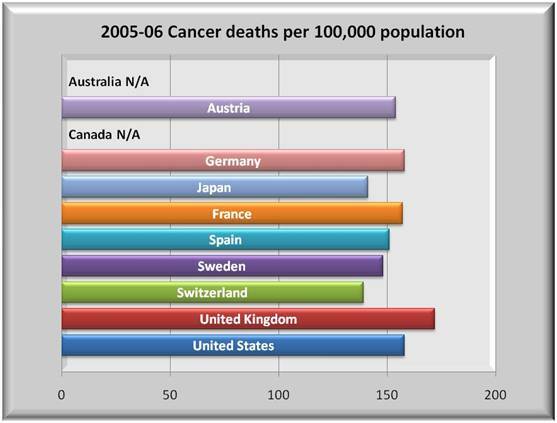 With cancer the leading cause of death, the U.S. is still only average. Average: 24.4% U.S. vs. Average: -34% Minimum: 14.5% Maximum: 40%. 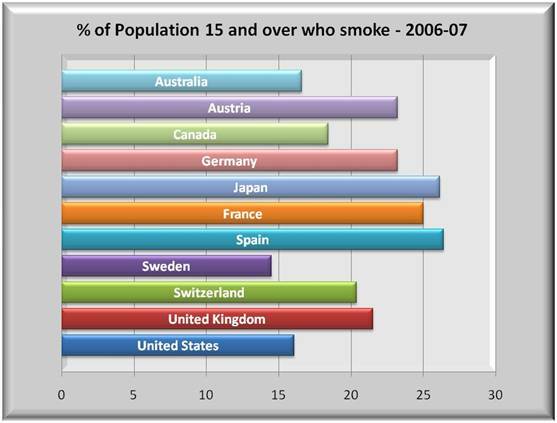 Despite more smokers in Europe, they still have longer life expectancies. The following tables offer a complete list of data available. Those highlighted are included above.